Home > Shop By Brand > Wolfgang Concours-Series Car Care > Wolfgang Uber Compound 3.0 8 oz. > Wolfgang Uber Compound 3.0 16 oz. Your search for the perfect compound is over! Wolfgang Uber Compound is a heavy-cut compound that is designed to restore the gloss and color to all paint systems without creating unsightly swirls or compounding haze. Formulated using an advanced blend of micro and diminishing abrasives, Wolfgang Uber Compound effortlessly removes heavy swirl marks, oxidation, water spots, and etchings from bird droppings without dulling the finish or creating new swirl marks. You control the aggressiveness of the compound by your pad selection. Wolfgang Uber Compound is arguably Wolfgang’s greatest undertaking since the brand’s inception. Designed with both the perfectionist and enthusiast in mind, Wolfgang Uber Compound has been tested and approved on a broader range of paint systems than any compound or polish that came before it. Wolfgang Uber Compound will surely impress even the most discriminating detailer with its immense leveling ability and the jaw-dropping levels of gloss that it creates. Every professional detailer and gloss-crazed car care enthusiast knows that a compound is defined by its abrasive technology. While most compounds utilize diminishing abrasives that break down, or micro abrasives that continue to cut as long as you work the polish, Wolfgang Uber Compound features both. By combining the milling process pioneered in Germany with Wolfgang’s proprietary micro and diminishing abrasives, Uber Cut Compound is safe and effective on all paint systems – factory or aftermarket – with any type of tool or pad combination, including dual action and rotary polishers equipped with foam, wool, or microfiber pads. Wolfgang Uber Compound is the most versatile compound available – period! 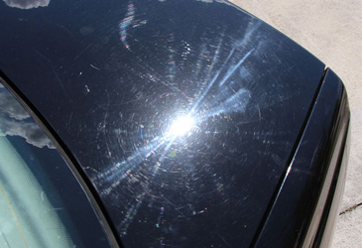 Before: Swirls, water spots and scratches were present on the hood of this black BMW. Wolfgang Uber Compound effortlessly removed all the defects wihout hazing or dulling the black paint. Wolfgang Uber Compound removes heavy swirls and scratches without dulling or hazing the finish. An ORANGE CCS pad from Lake Country is the ideal pad for most applications. 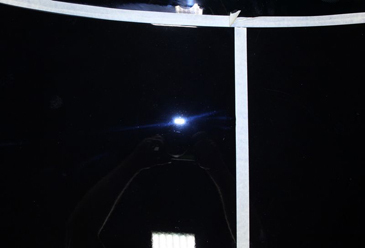 Can be used with a rotary polisher as well; select your pad based on the severity of the defects in the paint. Lake Country YELLOW, ORANGE, and WHITE foam pads are the most popular choices. Use a WOOL pad to remove sanding marks or deeper scratches. Works great to remove scratches underneath door handles too. Pictured is a CYAN EZ-Grip Hydro-Tech Hand Polish Applicator. Wolfgang Uber Compound is the solution to the problems that plague almost every vehicle on the road: swirl marks, water spots, and scratches! Wolfgang Uber Compound is able to remove up to 1200 grit sanding marks, heavy swirl marks, oxidation, and water spots without dulling or hazing even the softest paint systems. If Wolfgang Finishing Glaze wasn’t such an exceptional finishing polish that was able to make the finish look even glossier, one could argue that Uber Compound is the only product you need to create a flawless finish. A conventional heavy-cut compound utilizes large, chunky abrasives that scour or haze the finish, creating less-than-stellar results. Wolfgang Uber Compound combines diminishing abrasives and micro abrasive technology into one easy-to-use formula that eliminates imperfections while polishing to a high gloss. What’s more, Wolfgang Uber Compound doesn’t dust! Wolfgang Uber Compound has been tested and approved for all paint systems, including today’s ceramic clear coats. This type of paint was pioneered by Mercedes-Benz and requires a special compound to remove swirls and scratches. Wolfgang Uber Compound works equally well on soft paint systems commonly found on vehicles manufactured in Japan. Wolfgang Uber Compound is also body-shop safe – it doesn’t contain any waxes or silicones. Where does Wolfgang Uber Compound fit into the Wolfgang line? Uber Compound is the most aggressive polishing compound made by Wolfgang. Uber Compound is designed to remove imperfections that are too severe for Total Swirl Remover – Wolfgang’s heavy-cut polish. To create a shine worthy of a show car, you should always follow up either polish with Wolfgang Finishing Glaze – an ultra fine polish. Clay the vehicle using Wolfgang Elastic Poly Clay. This step removes above-surface contaminants including industrial fallout, paint over spray, embedded contaminants, bugs, and tar. If you don’t think your vehicle needs to be clayed, we urge you to stick your hand inside a sandwich plastic baggy and feel your paint. If it doesn’t feel perfectly smooth, then it needs to be clayed. Equip your dual action or rotary polisher with the appropriate foam or wool pad. We always advise using the least aggressive approach first. Try a Lake Country CCS WHITE polishing foam pad and if the defects are not completely removed, step up to a CCS ORANGE light cutting foam pad. To remove sanding scratches after wet sanding, use the appropriate WOOL pad on a rotary polisher. Apply 2-3 dime-sized drops of compound on the outer edge of the pad. Set your dual action polisher to speed 5-6. If you’re using a rotary polisher, set your speed between 1200 and 1500 RPM. Working on a section no larger than 12 x 12 inches, polish the area using firm downward pressure and a slow arm movement. Polish the area until the compound turns clear. Turn polisher off and remove residue. Polish entire vehicle using steps 4-6. 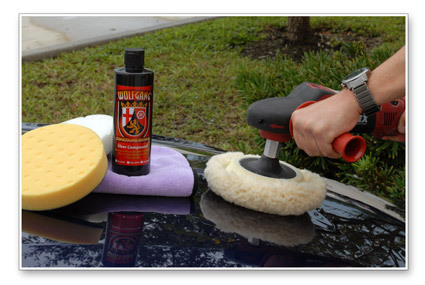 Once the entire vehicle has been polished using Wolfgang Uber Compound, switch to a less aggressive foam finishing pad and use Wolfgang Finishing Glaze. This step will further refine the surface, maximizing gloss to create a finish worthy of a show car. 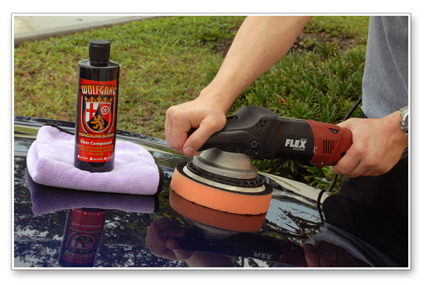 Lock in the shine and protect the finish with Wolfgang Deep Gloss Paint Sealant or Wolfgang Fuzion. 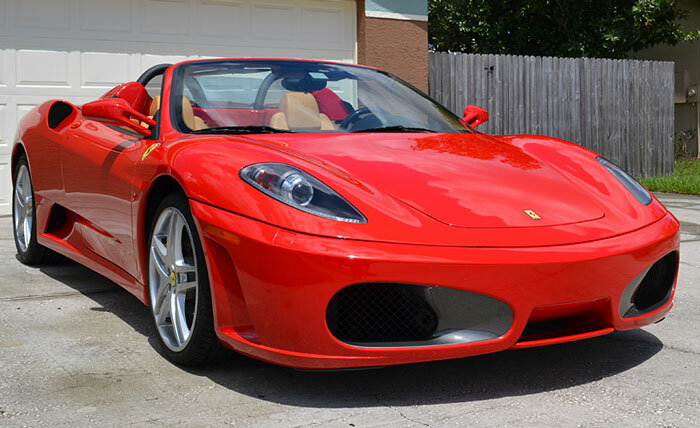 2008 Ferrari "Rosso Corsa Red" F430 Spider polished to a high-gloss, swirl-free finish using Wolfgang Uber Compound and Wolfgang Finishing Glaze. Once the paint was flawless, two coats of Wolfgang Fuzion was applied to make this prancing horse shimmer with depth and color. i ordered 2 other compounds and swirl mark removers besides this one. i liked this one very much. it did a very good job. by the way i am an amateur at this. i used the porter-cable oscillating buffer. no swirl marks or spider webs.i purchased the buffer and foam pads from auto geek also. it is perfect and forgiving for an amateur. Easy to use with DA, Easy to remove great results. ProsEasy to use with DA, Easy to remove. As advertised. Dark Blue Audi A4 with some rain spots. This was recommended to me since the prior product used didn't buff the spots out. Uber used with an LC Orange pad buffed it out and left one heck of a shine! Finished up with my meguiars 205 polish and a white LC pad and it looks fantastic. Unfortunately, I went to the airport and left the car outside for 3 days and it rained and then baked in 90 heat so I have to do it again! This product is easy to work with, I highly recommend it.